The Ayatollah’s listing of five counter-demands to the Europeans following Pompeo’s 12-point ultimatum to Iran plays right into Trump’s hands by making it seem like Tehran is “blackmailing” the US’ allies because it’s so desperate for Western investment, whereas the country should actually do away with those discredited “partners” and more openly embrace China, Pakistan, and the Central Asian Republics per a full-on Eastern Pivot to the Golden Ring. RT reported that one of the main demands that Iran just made of the Europeans in response to Pompeo’s 12-point ultimatum is that they continue to buy the country’s oil in order to guarantee that Tehran will continue to abide by the nuclear deal. Iran, like any sovereign and self-respecting country in the world, doesn’t have to accept any foreign ultimatum and has the right to issue its own to anyone else that it likes under any circumstances that it chooses. The problem in this case, however, is that it plays directly into Trump’s hands by making it seem like Iran is indeed “blackmailing the world” (or more accurately in this context, just the Europeans) like he said they were, which inadvertently gives a powerful boost to Trump’s narrative. Not only that, but this “confirmation” of his words comes right after the President said that the US will not deal with a country that chants “Death to America!” while he was announcing Washington’s withdrawal from the deal, after which Iranian lawmakers did just that inside their parliament. As stated, all countries and their representatives have the right to express themselves however they so choose, but the knife cuts both ways and that means that there shouldn’t be any double standards in this regard when it comes to the Iranian government or the American one. Furthermore, both of them must accept that their actions have consequences, whether they intend for them to do or not, and that it is impossible in this day of hyper-infowar campaigns to fully control how each and every person in the world reacts to what one says or does. For as boorish as Trump comes off to the Europeans irrespective of his intentions and how he perceives of himself, so too are the Iranians being perceived by them as prone to “blackmail” and perhaps even a little bit desperate if they come to think about it. Increasingly, one of the most “inconvenient facts” of the nuclear deal is becoming ever the more obvious, and it’s that the promises of economic assistance to the Islamic Republic were very vague and never clearly defined. Everything was built on the nebulous and fleeting concept of “goodwill”, with Iran trusting that each of the P5+1 countries would be racing to invest in its human and natural resources for the simple reason that the country had hitherto been one of the world’s most promising untapped markets due to decades of sanctions. Basic economic theory implied that it would never be a problem for any of those Great Powers to keep their economic end of the bargain, and that whichever of them might possibly pull out of the deal in the future (relevant only for the most part to the US) would just be missing out because their partners would quickly fill in the void and make it seem like they never left. The basis for believing this was conceptually sound but has nowadays been disproven in practice because the US is “hacking” economic theory through the reimplementation of a far-reaching sanctions regime that Pompeo threatened will be the toughest ever applied against a country in history. America is successful in wielding sanctions as a Hybrid War weapon against its own European partners because the US is one of the world’s largest markets with a robust purchasing capability, and the government can stop any country from accessing it and therefore deprive them of profits if they violate its new anti-Iranian economic restrictions. Accordingly, a “chain reaction” of sanctions can also be implemented in sanctioning, for example, a German company that doesn’t do business in the US but only in Iran and the EU, with Washington then threatening to expand its punitive measures to include all other companies anywhere in the world who continue to business with it. As a result, that said German company, in this instance, could quickly become “untouchable” because none of its partners would want to risk America’s economic wrath by doing business with them and losing access to the US’ market in response. At the end of the day, for as “politically inconvenient” as it is for some to acknowledge, many companies need the American marketplace and specifically the American dollar to maintain a comfortable profit margin, satisfy investors, and keep people in work. The US is leveraging this state of economic affairs to its strategic advantage like never before, which is evidently seen by Trump’s willingness to engage in “trade wars” with China and the EU, to say nothing of the preexisting sanctions against Russia. The latter never truly “integrated” into the Washington Consensus so is relatively less affected by this although some sectors of its economy and elite interests are nevertheless hurting right now, but the first-mentioned two of the EU and China are much more vulnerable to the US’ geopolitical weaponization of sanctions, especially the Europeans. A sober reading of the strategic situation would have presciently revealed this even before the deal was signed, but the euphoria of the moment evidently blinded Iranian decision makers to this fact. The Iranians are finding it very difficult to accept that their EU “partners” will probably passively go along with the US’ sanctions, and several reasons account for this. The first is that the euro is a strong currency in general and functions as an alternative to the dollar for reserve purposes, trade, and banking, and Tehran may have bet its future on it from 2015 onwards. Accordingly, dealing with the Europeans on what Iran had previously assumed would be its own terms brings a lot of prestige to its elite because it’s seen as a reversal from the shameful periods of history when the West dominated their country. The general population is also involved in this too, since they were given unrealistically high hopes that long-awaited sanctions relief was finally arriving and that they too could have a chance to “climb the ladder of success” in trading in or working for euros after the West “atones for its historical sins” by doing business with them on their leadership’s terms. “The West”, in this case, isn’t just the cultural-civilizational one that was referred to up until this point, but also the geographic one of the “Mashriq”, or West Asia/Mideast, which also has a powerful hold over the Iranian government’s psyche. Following the 1979 Islamic Revolution, Tehran thought that this part of the world was the most fertile for exporting its governing model per the constitutional stipulation that it “strive with other Islamic and popular movements to prepare the way for the formation of a single world community”, a bold declaration that frightened its secular and monarchist neighbors just like Trotsky’s one of “world revolution” did the same after 1917. Although Iraq initiated the First Gulf War with Iran at the behest of its Western & Arab backers and with the implicit support of the Soviet Union, Iran continued the war for years after it had already reached a stalemate in order to militantly spread the revolution westward as vengeance for Saddam’s atrocities, similar in a sense to what the USSR sought to do against the Nazis during World War II. Regrettably for Iran, the outcome was much different for it than for the Soviet Union, but the concept of exerting influence westward for interlinked ideological and security reasons was forever embedded in its leadership’s mentality. That’s why it’s so difficult for Iran to accept that Trump has more or less succeeded in finally creating a multinational US-led “containment” coalition against it along the country’s Western flank which flexibly incorporates military, economic, and strategic dimensions from each of its participants, whether willingly engaging in this effort like “Israel” and Saudi Arabia are or passively facilitating it like Russia does in allowing Tel Aviv to bomb the IRGC and Hezbollah at will inside of Syria. The predicted “rollback” of Iranian influence from the Mashriq is forcing Iran’s leadership to do away with the predominant ideological drivers of their strategy and reconceptualize their country’s role in Eurasia by embracing geostrategic pragmatism through a full-on Eastern Pivot towards Pakistan, China, and the Central Asian Republics. Iran’s civilizational footprint in Pakistan and Central Asia is millennia-long and in most geographic reaches even predates Islam, making it just as much, if not more, of a “natural” part of the world for Tehran to focus on as the Mashriq. Nevertheless, the Western flank had taken on a priority for Iran following the encroachment of the Russian and British Empires on the country’s former possessions in Central and South Asia in the 19th and early 20th centuries, after which the commencement of the Old Cold War made it impossible for Tehran to functionally engage with its civilizational cousins in what had by that point become the communist Soviet Union. Iran’s state secularism prior to the 1979 Revolution found it some common ground with other secular countries in the West, though it was dominated by the US & Europeans and in submission to “Israel”. The Islamic Revolution was an economically and geopolitically liberating experience for most Iranians but it also made their new government the main enemy of its former Western “partners”, which it continued to spar with through various proxy wars up until the present day. The moment is fast approaching, however, where the US-led “containment” coalition will militantly put a stop to the expansion of Iranian influence in the Mideast, if it hasn’t done so already, thereby forcing the Islamic Republic to reconsider its geostrategic priorities and seriously contemplate an Eastern Pivot for relief from what might eventually become overwhelming pressure against it. As Trump succeeds in cutting off Iran’s economic connections with the West and bombing or strategically neutralizing its allied non-state partners in Syria, Yemen, and Iraq, Tehran will basically have no choice and will be forced to do this sooner than later if the government wants to stay alive. The sanctions regime that the US is in the process of implementing will carry with it an unparalleled economic cost to the Iranian people and aims to provoke identity-centric conflict that could then be manipulated into a nationwide regime change campaign, and the most prudent way of avoiding this “dark scenario” is for Iran to pivot eastward to China, Pakistan, and the Central Asian Republics through the Golden Ring partnership of multipolar Great Powers that also includes Turkey and Russia. Granted, Russia is presently “balancing” Iran in the Mashriq (particularly Syria and Iraqi Kurdistan), but for pragmatic reasons related to both parties’ self-interests, they’re nonetheless expected to continue enjoying excellent bilateral relations with one another that help undergird the geostrategic success of the Golden Ring. In a sense, Russia’s “balancing” moves are actually pushing Iran in the direction of its Eastern Pivot and “doing it a favor”. Iran’s “blackmail” of Europe isn’t just a soft power folly for its international reputation in the eyes of its (former) Western “partners”, but also signals its leadership’s psychological desperation to chase the investment benefits that it was promised at all costs, no matter how impossible they may soon be to ever receive given the EU’s predicted willingness to bend to Trump’s sanctions demands. It’s been nearly four decades in the making, but Iran must finally accept that it will never regain its Shah-era relations with the West so long as it retains its governing model of Islamic Republicanism. Concurrent with this, Iranian influence is being “rolled back” all across the Mashriq, and its leadership must also come to terms with this as well. Nothing in this analysis is suggesting that the country “surrender”, but just that it engage in a “tactical retreat” that provides added impetus to its inevitable Eastern Pivot towards China, Pakistan, and the Central Asian Republics. Iran already has millennia of direct civilizational relations with the latter two that could be put to excellent use in forming the basis for a new multilateral partnership with them built on pragmatic shared interests, unlike the ideological-political motivations for its Mashriq moves ever since 1979. Iran and its two direct Great Power neighbors of Pakistan and Turkey could even revive the Old Cold War-era “CENTO” integrational vehicle in a New Cold War multipolar configuration that lays the groundwork for a powerful “Muslim Belt” of Great Powers to form along the South Eurasian Rimland and constitute half of the Golden Ring that could be completed through a strategic convergence with Washington’s worst nightmare of the Russian-Chinese “double helix”. Truth be told, Iranians should be thankful for Trump because he’s giving them a reason to wholeheartedly embrace their country’s destined Silk Road future, just like President Putin’s military partnership with “Israel” in Syria is doing the same as well. 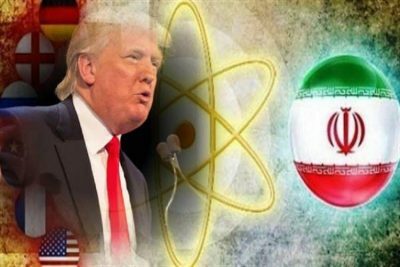 The US, however, is Iran’s geostrategic enemy and will remain its ideological one for as long as the country continues with its Islamic Republicanism form of governance, while Russia is better described as a partner with whom Iran has a long & complicated history and sometimes naturally enters into disagreements. Russia, though, is not Iran’s enemy despite their increasing competition with one another in Syria and parts of Iraq, and Moscow is actually more than eager to expand bilateral relations with Tehran and even multilateral ones with it through the Golden Ring concept. Iran might not appreciate that Russia is “nudging” it towards an inevitable Eastern Pivot for its own self-interested reasons in Syria (which Moscow believes to more or less be in everyone’s “win-win” interests following a series of unavoidable “compromises” there), but it might one day look back fondly at that moment and be thankful for Russia’s “tough love” if the Moscow-facilitated Eastern Pivot succeeds.